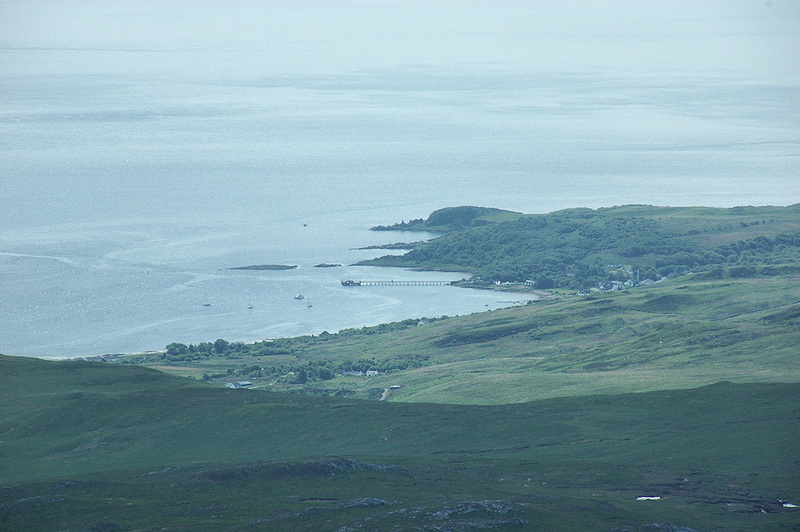 Craighouse is the main settlement on Islay’s neighbour Jura. This view is from the summit of one of the Paps of Jura, Beinn Shiantaidh. While parts are hidden by the lower hills below you can the roofs of the distillery and the hotel on the right hand side. Clearly visible the long new pier in the centre of the picture. I believe the houses slightly inland towards the bottom left of the picture are in Keils. This entry was posted in Distilleries, Jura Excursion, Landscape, Repost, Sunny Weather, Village and tagged Bay of Small Isles, Beinn Shiantaidh, Craighouse, Jura, Paps of Jura by Armin Grewe. Bookmark the permalink.